You earned a “Mom’s Time Out!” Join other mommas while we discuss the theme of faithfulness in motherhood. There will be chocolate, encouragement, panel discussion and more chocolate! 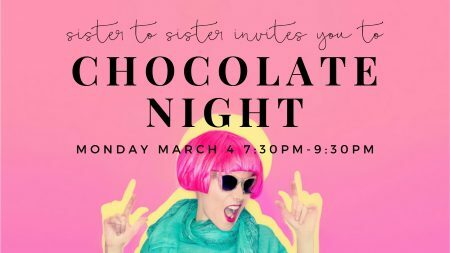 Grab another deserving momma and enjoy this Sister to Sister night. We will meet in the Chapel from 7:30 – 9:30 – hope to see you there!